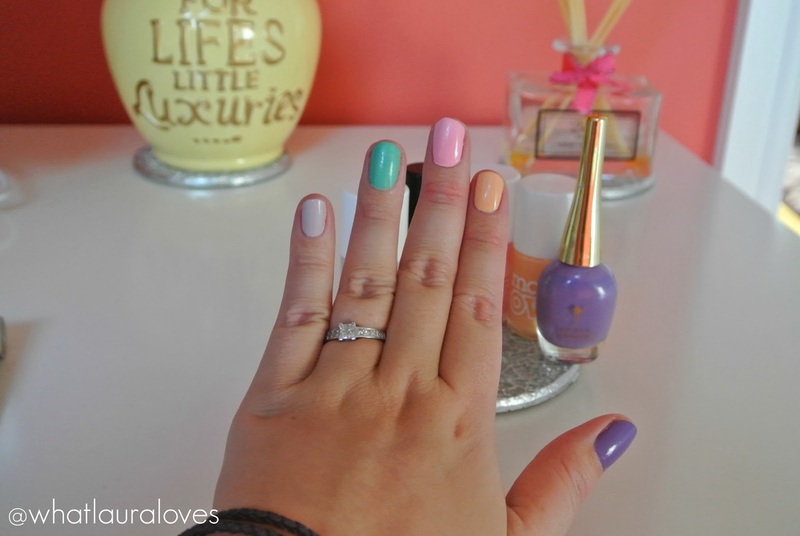 Springtime is here and my nails are looking super pretty in pastels. There’s just something about the spring that really gets me feeling motivated and full of life- I think its the long days and light nights. Every year I look forward to the spring so that I can crack out the pastel shades whether it be clothing, jewellery or nail polish as I love how soft and girlie the colours are. I rock pastel colours all year round- pastel pink nails in winter look great with greys and knitwear but in the springtime I really go to town and change them up loads. I don’t think I ever paint my nails as much as I do around this time of the year! The majority of my springtime polishes come from Models Own; they’re a staple polish brand for me that I know is good quality and great looking however my favourite springtime nail polishes actually feature a couple of other brands that are rocking my world at the moment. Over there on my pinky is Models Own Utopia. Standard. 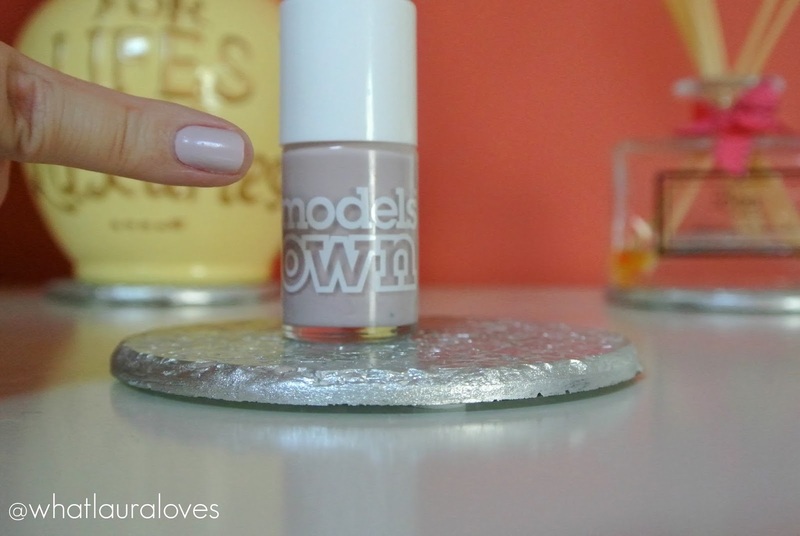 This grey lilac shade is a staple in my nail polish collection and one of my all time favourites. The colour looks so milky and creamy, I absolutely love it, and it has a subtle shine to it so it isn’t completely matte and chalky. It applies evenly, dries quickly and is opaque in two coats. The colour compliments my skin tone even when I’m at my palest but when I have a tan– oh it’s magical. Utopia is one of those shades that I can wear with any outfit as warm toned outfits seem to warm it up and cool coloured clothes seem to bring out its icier qualities. There’s a full review of it here and you can buy a bottle for yourself here or here. The polish on my ring finger is the Barry M Nail Paint in 304 Mint Green that my super cute bichon frise also took a liking to and nibbled at the top… Grr. I’ve been using this polish for years and once I got over the streaky consistency and the need to apply at least two coats (these days, I find three works best for the optimum opaque looking nails), I began to focus on the gorgeous colour which is a true mint green. For a pastel shade, it is quite vibrant and really stands out. This isn’t a shade I would wear on my toes but I adore it on my fingers, especially when I’m tanned. I love to wear Mint Green with navy, blue, green floral outfits during the spring. It even looks great with my black work wear as a gorgeous pop of colour and don’t even get me started on how amazing it looks with a white outfit. My review of this polish was posted way back when in 2010 (I’m a poet and I didn’t know it!) but my thoughts on it are still the same and the polish is still going strong almost 4 years later which is a testament to how good it is so if you’d like a read of that then click here and if you’d like to buy one of your own then you could head on over to the Barry M website but might I suggest Superdrug or Boots as they tend to have the best deals. It’s back to Models Own again for the polish on my middle finger and this time it is the shade Pastel Pink which is the ultimate creamy pastel polish. It is opaque in two coats (although my bottle is getting a little dried up and is starting to drag on the nail so I’m starting to head towards three) and leaves a vivid pastel pink shade on the nails with an even application and fast drying time. Pastel Pink looks amazing all year round and is the pink shade I wear in winter with my grey knitwear. However in the springtime, I like to wear this with really cutesy, girlie outfits, generally during the daytime. Pastel Pink was actually the first ever polish that I reviewed on WhatLauraLoves back when I first started blogging, in fact it was my first review of anything and my second post in my blogs history- now that’s what I call a Throw Back Thursday! You can read my review here and pick one of your own up from Boots or direct from Models Own. On my index finger I have, yes, you guessed it, another Models Own polish. This one is called Peach Sherbet which is a creamy matte peach shade that just oozes springtime appeal. This is the one polish out of the bunch that definitely looks better on me when I have a tan and doesn’t really suit my skin tone when I’m pale… but given that I prefer to be tanned all of the time, this doesn’t bother me. Just like the other Models Own polishes, it is opaque in two coats with an even application and a fast drying time. I love wearing Peach Sherbet when I’m super tanned and wearing a mixture of pastel florals as I feel that it really compliments the warmer pastel tones in my outfits. You can pick yours up from Boots or direct from Models Own and you can read my review over here. The last polish in the bunch is a very recent addition to my nail polish collection in comparison to the other four, having only reviewed it last December here and that’s Blueberry Muffin by Jacava. This polish is amazing because although I always apply two coats, it could easily be left at one as it is super opaque and it lasts for ages without chipping. Blueberry Muffin is a pastel purple but a bright and vivid one at that so it gives me the creamy appearance that I want from a pastel polish but the vivid appearance that I want from a bright polish. I like to wear this shade either when I’m wearing a darker outfit for work and I want a pop of colour or when I’m wearing an outfit with purple or lilac in as it really helps to bring that colour out in the outfit. I was going to put Lilac Dream by Models Own in here as that is one of my favourite polishes of all time but I wanted to show you a range of brands and this Jacava one is so similar, only a little dark with a slight more of a Cadbury purple edge to it. Jacava polishes are the most expensive out of all of the polishes I’ve featured here but they are well worth the price tag. You can get them direct from their website or on Feel Unique (my personal favourite website for ordering). Phew, that was so hard to narrow down my choices as I have an abundance of pastel shades in my collection but these five are definitely my favourites right now and the ones that I’m getting the most wear out of. Great collction!i love theses colors! Dear Laura,I am a huge fan of your page. you are a very beautiful spirit and your beauty reflects on your outside. I can say you are my rule model and i have one question for you. I am over-weight and I love all pretty things like any girl my age. I get complements on my taste a lot but I do not like what I see in the mirror or photos. you wont see one pic of me on any social media because i hate to see myself so much. how can i be just like you? when i am shopping sometimes and i like something expensive i tell myself what is the point it is not gonna look good on me anyway. how do i overcome this feeling of low self-esteem?